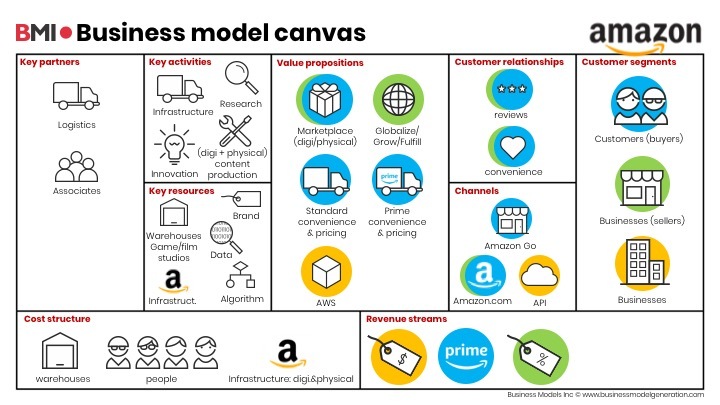 Learn what the exponential elements are in the business model of Amazon. Amazon solves problems for the many, consumers and businesses. The Amazon retail business model is serving consumers who want the best deals delivered to them in the most convenient way. The Amazon services business model is providing businesses all around the world a way to reach millions of customers, making marketing and selling easier. Info-based offering. The value proposition for consumers is a vast collection of everything: electronics, apparel, computers, books, DVDs & more. All they offer is at the lowest price and shopping and delivery is with the utmost convenience. The value proposition for businesses is a whole range of solutions to grow a business, from selling on the Amazon Marketplace, through Fulfillment, to advertising and brand building. The value propositions for both customer segments are information-based offerings. They are personalized and customized based directly on the needs and preferences of their customers. Lean way of working. It’s always Day 1 at Amazon, which ensures the entire company is focused on results (not process), makes decisions quickly, and is looking outside for important trends. These three elements of the philosophy are actively used by people within the company to drive and explore value creation for customers. The Day 1 mindset encourages, motivates, and challenges everybody to embrace change and experiment with what works for customers and what doesn’t. Algorithm to the core. As a digital native company, Amazon is using data to drive decisions to improve the shopping and user experience. Since the start of the company they have been using machine learning, initially to help human editors recommend books from their huge library. The machine learning skills developed internally has later been turned into a web service for developers as part of the Amazon Web Services (AWS) proposition, among other applications. Self-managed teams. At Amazon, everybody is part of a team responsible for value creation (customers or internal). Their job website is explicitly recruiting people for teams and they show applicants what it is like to work in a particular team. Amazon fully uses the diversity in backgrounds and perspectives to improve their value propositions and invent for customers. Teams are truly in the lead to drive value creation for customers and as such see the direct impact of the work they do on customers.